Smart skin is a large-area, flexible array of sensors with data processing capabilities, which can be used to cover the entire surface of a machine or even a part of a human body. Depending on the skin electronics, it endows its carrier with an ability to sense its surroundings via the skin’s proximity, touch, pressure, temperature, chemical/biological, or other sensors. Sensitive skin devices will make possible the use of unsupervised machines operating in unstructured, unpredictable surroundings among people, among many obstacles, outdoors on a crowded street, undersea, or on faraway planets. Sensitive skin will make machines “cautious” and thus friendly to their environment. This will allow us to build machine helpers for the disabled and elderly, bring sensing to human prosthetics, and widen the scale of machines’ use in service industry. With their ability to produce and process massive data flow, sensitive skin devices will make yet another advance in the information revolution. This paper surveys the state of the art and research issues that need to be resolved in order to make sensitive skin a reality. Some applications that smart skin devices will make possible are yet hard to foresee. Flexible semiconductor films and flexible metal interconnects that will result from this work will allow us to develop new inexpensive consumer electronics products, new types of displays, printers, new ways to store and share information (like electronic paper and ―upgradeable‖ books and maps). New device concepts suitable for large area flexible semiconductor films will lead to new sensors that will find applications in space exploration and defense, specifically in mine detection and active camouflage. An ability of parallel processing of massive amounts of data from millions of sensors will find applications in environmental control and power industry. 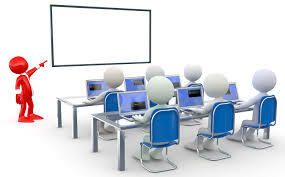 These areas will be further developed because of the highly interdisciplinary nature of the work on smart skin, which lies at the intersection of information technology, mechanical engineering, material science, biotechnology, and micro- and nano electronics. Availability of smart skin hardware is likely to spur theoretical and experimental work in many other disciplines that are far removed from robotics. Smart Skin material will hold embedded sensors and related signal processing hardware. It needs to be flexible enough for attaching it to the outer surfaces of machines with moving parts and flexible joints. - The skin must stretch, shrink, and wrinkle the way human skin does, or to have other compensating features. Otherwise, some machine parts may become "exposed" due to the machine's moving parts, and have no associated sensing. - Wiring must keep its integrity when Smart Skin is stretched or wrinkled. This requirement calls for novel wire materials, e.g. conductive elastomers or vessels carrying conductive liquid, or novel ways of wire design with traditional materials, such as helical, stretchable wires. Fabricating smart skin is based on a new process of depositing polycrystalline CdSe (1.75 eV), CdS (2.4 eV), PbS (0.4 eV) , PbSe (0.24 eV) and CuS (semiconductor/ metal) films on flexible substrates at temperatures close to room temperature (eV here are electron-volts). Large area surfaces can be covered. Also, ternary and quaternary compounds as well as heterostructures can be deposited. 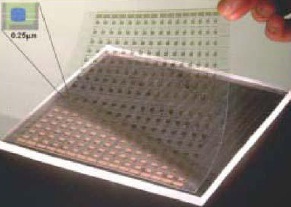 Transparent conductors on flexible substrates (such as CuS), materials for sensors, with possible combination with higher mobility polycrystalline materials (such as laser annealed polycrystalline silicon), amorphous (such as a-Si), polycrystalline (such as CdS or CdSe), and deep submicron crystalline silicon technology (for fast data processing). We will also need sensors with multiple sensing capabilities, learning, once again, from the design of human or animal skin. These are new and exciting challenges for material science and device physics. A central issue for smart skin is that the skin be able to conform to surfaces of arbitrary shape, and be able to flex, bend, and stretch. Flexing, bending, and stretching are important not only for applications (e.g. covering moving arms and joints), but also for initial installation (like putting on clothes). When a thin planar foil is deformed into ―developable‖ surface such as a cylinder or a cone, the average strain in the foil is zero, and there exists a ―neutral plane‖ within its bulk where the strain locally is zero. The strain on the surfaces scales as the thickness over the radius of curvature. Therefore by making the substrate thin and /or placing interconnects at the neutral plane, bending to thin radii of curvature appears possible. However, deforming into arbitrary shapes (e.g. spheres), bending in multiple dimensions, and stretching require a finite strain, and hence may cause failure of the interconnects (e.g. if the strain is larger than 1%). Three different models for the substrate/interconnect system evolved. Adding sensors/actuators/intelligence to the substrate will be discussed in the next major section. Smart Skin will be a form of large-area electronics, and a large-area electronics industry already does exist. Flat panel displays, including active matrix liquid crystal displays and plasma panel displays, are products of this industry. The medical X-ray sensor panels that are in pilot use likewise are large-area electronic products. These flat panel products use glass plates for substrate and encapsulation, and are rigid. Flexible, active circuit technology is just coming out of the research laboratory, like OLEDs on plastic foil, laser crystallized polysilicon on polyester, TFTs on polyamide, and OLEDs integrated with TFTs on steel foil. 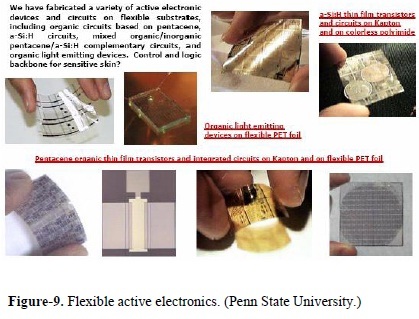 In other words, the basic technology for flexible skin electronics is coming together. Organic thin film transistors (OTFT) are based on a new class of materials called conjugated polymers. Organic thin film transistors are considered as a competitive alternative to the traditional inorganic semiconductor based thin film transistors. In terms of performance, organic materials are not likely to catch the inorganic semiconductor based transistors, however, low cost, large area, and reel-to reel manufacturing can bring new opportunities where inorganic electronics cannot obtain. The capability of plastic-based displays provides broad applications for industrial and product designers. The technical venture plans to create flexible organic-TFT technology, which has the potential to dramatically reduce the cost of display back planes while enabling the fabrication of lower cost flexible display devices. Organic materials are poised as never before to transform the world of circuit and display technology. The future holds tremendous opportunity for the low cost and sometimes surprisingly high performance offered by organic electronic and optoelectronic devices. Using organic light-emitting devices (OLEDs), organic fullcolor displays may eventually replace liquid-crystal displays (LCDs). Such displays can be deposited on flexible plastic foils, eliminating the fragile and heavy glass substrates used in LCDs, and can emit bright light without the pronounced directionality inherent in LCD viewing, all with efficiencies higher than can be obtained with incandescent light bulbs. Smart skin is a large array of sensors embedded in a flexible, stretchable, and/or foldable substrate that might cover the surface of a moving machine. By endowing these machines with ability to sense their surroundings, smart skin will make it possible to have unsupervised machinery in unstructured, unpredictable surroundings. Smart skin will make the machines ―cautious‖ and thus friendly to their environment. With these properties, smart skin will revolutionize important areas of service industry, make crucial contributions to human prosthetics, and augment human sensing when fashioned into clothing. Being transducers that produce and process information, smart skin devices will be generating and processing data flows in real time on a massive scale, which will lead to yet another leap in the information revolution. Smart skin presents a new paradigm in sensing and control. It is an enabling technology with far reaching applications, from medicine and biology to industry and defense. The state of the art in the areas that are basic to development of the skin technology shows that highly efficient devices should be feasible, meaning by this high density of sensors on the skin, and hierarchical and highly distributed real time sensor data processing. All this non withstanding the fact that the existing prototypes are clumsy, have low resolution, accuracy and reliability, and are not yet ready for commercialization. Serious research issues elaborated in this paper have to be resolved before sensitive skins can become a ubiquitous presence in our society. We hope the readers will view this paper as our first effort to map out the new territory, and as an invitation to join in the exploration.